You can increase the flexibility of your templates by nesting them together. Nesting means assigning one template to another template. A nested template has a parent. You can nest as many templates as you want, but each template can have only one parent. For example, suppose you’re prototyping an eCommerce site. The prototype includes a header template that’s used on all designs, and a subnavigation template that’s used only on product-related designs. To effectively reuse your work, you should nest the subnavigation template with the header template. That way, any changes made to the header content automatically propagate to all designs. In this case, the header template is the parent of subnavigation. 1. Open the template to be nested. For this example, open the subnavigation template. Open the template via the Library, or when editing a design that uses the template. 2. Add the parent template. 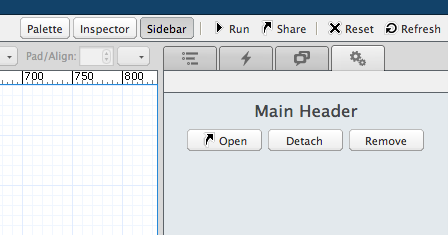 Drag the header template onto canvas. This templates appears as the parent in the Sidebar. As shown below, the parent template is available via the Sidebar.